A range of exploration drilling scenarios from which the following activity levels, based on recent historical experience, are adopted as the central estimates. Salt water occurring with oil and gas in the reservoir. Taking rock samples from a well by means of a special tool — a "core barrel". 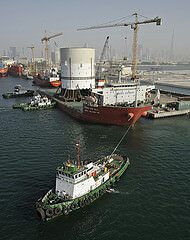 A large barge, capable of lifting heavy equipment onto offshore platforms. Also known as a "derrick barge". A standard unit used to measure quantity of gas (at atmospheric pressure); 1 cubic foot = 0.0283 cubic metres. An Exploration well which has encountered hydrocarbons. A well which has proved to contain no hydrocarbons. A well in an unproven area or prospect, may also be known as a "wildcat well". A pipe, laid on the seabed, which allows the transportation of oil/gas production or injection of fluids. Its length can vary from a few hundred meters to several kilometers. A method of breaking down a formation by pumping fluid at very high pressures. The objective is to increase production rates from a reservoir. The volume of gas at atmospheric pressure produced per unit of oil produced. The method of making a connection to an existing pipeline containing hydrocarbons under pressure. Complex mixture of compounds with large molecules containing mainly hydrogen and carbon but also oxygen, nitrogen, and sulfur. A well is said to "kick" if the formation pressure exceeds the pressure exerted by the mud column. Million Barrels Oil Equivalent. Metric tonne Equivalent to 1000 kilos, 2204.61 lbs; 7.5 barrels. An aperture in the centre of a drillship or semi-submersible drilling rig, through which drilling and diving operations can be conducted. The company that has legal authority to drill wells and undertake production of hydrocarbons are found. The Operator is often part of a consortium and acts on behalf of this consortium. The percentage of void in a porous rock compared to the solid formation. Those reserves which at present cannot be regarded as 'probable' but are estimated to have a significant but less than 50% chance of being technically and economically producible. The cash or kind paid to the owner of mineral rights. A BERR definition of a well which flow tested, or would have flowed, at a rate of 1000 barrels of oil a day or 15 million cubic feet of gas a day. A well that has been capped off temporarily. tcf Trillion Cubic Feet (of gas). The superstructure of a platform. Well log A record of geological formation penetrated during drilling, including technical details of the operation. An assembly of steel tubes and/or thermoplastic hoses which can also include electrical cables or optic fibres used to control subsea structures from a platform or a vessel.